What is the Solution for Crawl Space Problems? The CleanSpace Crawlspace Encapsulation System® dries out your crawlspace and eliminates poor indoor air quality, excess humidity, musty odors, and cold floors. Because vents in crawl spaces do not perform as they were originally thought to, a new approach to crawlspace design is needed. The CleanSpace® Crawlspace Encapsulation System and our crawlspace products represent the new crawlspace thinking! CleanSpace® completely and permanently separates the home from the environment of the surrounding earth. Its 20 mil thick durable material (similar to a pool liner) lines the floor and walls of the crawlspace. Made of five layers of polyethylene and two layers of polyester cord reinforcement, it's designed to keep your crawlspace free of mold, insects, and dirt! 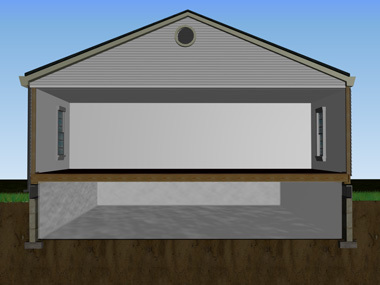 Once installed, your crawlspace is surrounded in thick, durable, clean white liner. With a 25-year warranty against holes, tears, and groundwater on the surface of the liner, it's tough enough for you or a serviceman to crawl on. You can even use it for storage of infrequently used items (such as the pressure washer or camping equipment that is taking up valuable space in the garage). If you have block walls in your crawlspace, there will be an area at the top where the openings at the top of the block are exposed. We use our WallCap liner to seal these spaces with a plastic cover that protects you from humid, molding air infiltration. The WallCap liner is clear so that an inspector can examine the area for insect infestation without having to remove the liner.